Prescribed fires help prevent wildfires by burning off fuels that naturally build up over time. 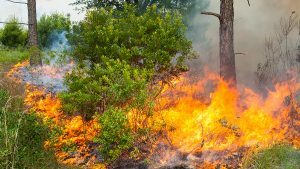 PALATKA, Fla., April 11, 2019 — The St. Johns River Water Management District is conducting a 204-acre prescribed burn Thursday at the Longleaf Flatwoods Reserve in Alachua County around the trailhead and along County Road 325. The purpose of the burn is to maintain fire-dependent ecosystems and reduce wildland fuel loads. The white trail, portions of the yellow trail and the red/white connector will be closed for the duration of the burn. Prescribed fire is the use of carefully planned fire purposefully set under stringent conditions to control the fire’s effects. Its benefits include restoring and maintaining natural communities, reducing chances of destructive wildfires, perpetuating fire-adapted plants and animals, cycling nutrients, controlling tree diseases and opening scenic vistas. Prescribed fires help prevent wildfires by burning off fuels that naturally build up over time, while also helping to control the growth of woody shrubs. Before conducting a burn, the district ensures that wind and other weather conditions are correct for managing the fire and minimizing the impacts of smoke to residents and traffic.